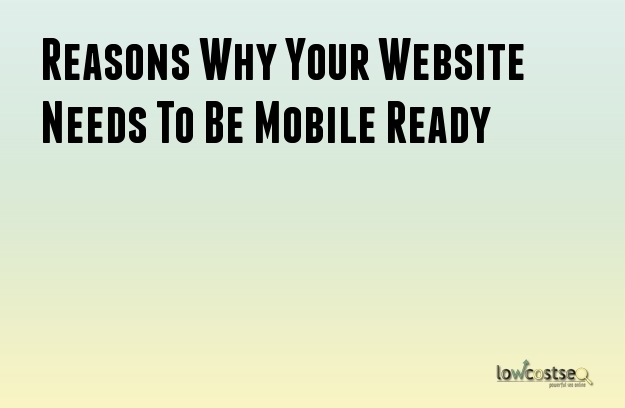 It has become more important than ever to have a website that can be viewed in mobile devices. Even Google is planning to release an algorithm update which is solely to improve mobile friendliness of websites. If your website is mobile friendly you can enjoy a higher ranking easily when the update is released. Google wants its users to have the best experience possible while making searches. That is why they tend to give preference to websites that can provide good quality information. As more and more people are starting to use their mobile devices to browse the web. If they are unable to view the website properly, they are bound to leave the site within seconds. That is why Google is giving preference to mobile friendly websites. They want the users to be able to get the necessary information quickly. A good ranking in Google is not the only reason why you need to make your website compatible with mobile devices. It will be important so as to give a good experience to the users of your websites. The majority of customers will prefer to visit a website that is easily viewable in mobile devices. This also means that they will get annoyed if they are unable to perform the basic functions when opening the website through a mobile device. Most users do not wish to engage or enter into deals with companies if they had a poor experience while using their websites. Customers are bound to feel that the company does not care about their business enough if their mobile website does not work properly. Before you start optimizing your website for mobile users, you should take a look at the wishes of the customers and users. As they will be using the website, it becomes important that your website has the functionalities and features that they desire. This will help you optimize the website in the proper manner. Users will prefer websites that enable them to find what they need within just a couple of clicks. Therefore avoid complicated navigation systems. The website should be a proper fit the screens of mobile devices. Users will find it easier to navigate through your website if you have a search bar. The search bar should be easy to use. It is irritating for users to have to scroll sideways when they are already scrolling vertically. You should include bigger buttons wherever possible to help the users click more easily. An option should be included which allows the customer to place a call with just a single click. It is possible to include an email option as well in the website. Add buttons to help users share content easily on the various social networks. The website should be clean and the design should enhance its efficiency of use. According to the latest trends, the number of people accessing the internet through their mobile devices will soon overtake the number of desktop or laptop users.